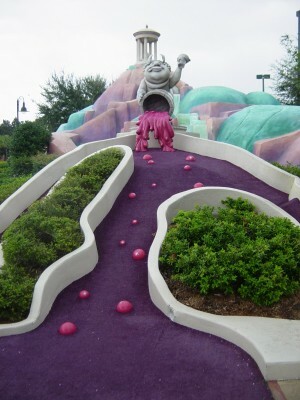 I decided to do something different this time around and take you on a photo tour of the fanciful Fantasia Gardens miniature golf course. 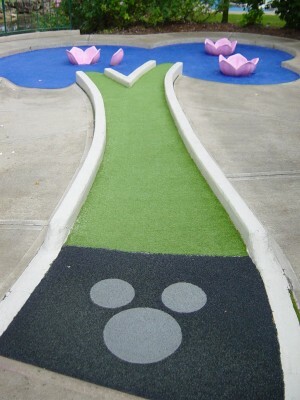 While not exactly a difficult course, the whimsical hole design and delightful sculptures make it an enjoyable place to spend an hour or so. The course starts with Toccata and Fugue, featuring sheet music for the opening of the piece. Photo by Mark Goldhaber. 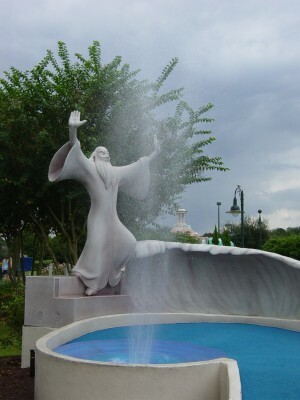 The course is themed to five of the segments of the Disney animated classic Fantasia: Toccata and Fugue in D Minor, The Nutcracker Suite, The Pastoral Symphony, Dance of the Hours and The Sorcerer's Apprentice. 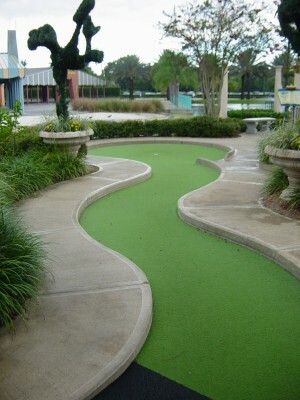 Each segment carries its theme for three to five holes. 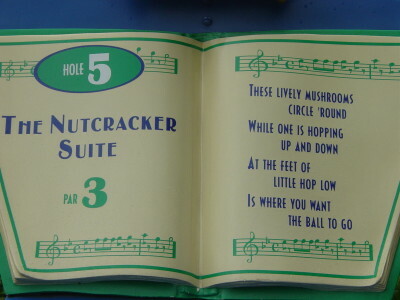 Each hole has a sign made to appear like a music stand, which has the hole number, the piece of music that inspired the hole, the par for the hole (every hole is a par 3) and a short poem giving instructions and/or a description for the hole. Oh, and each one also has a small bit of sheet music from that particular piece. There is one set of notes for each musical piece, regardless of whether there are multiple themes used for them in the movie. For example, the notes are the same for all of the "Nutcracker Suite" holes, despite the fact that the "Dance of the Reed Flutes," "Chinese Dance," and "Waltz of the Flowers" segments are all represented. So, without further ado, let's get the (golf) ball rolling. The course starts with Toccata and Fugue. 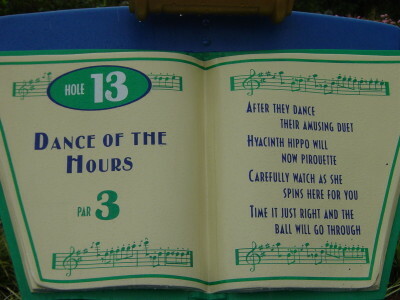 The "music stand" sign for the first hole features sheet music for the opening of the piece. Photo by Mark Goldhaber. 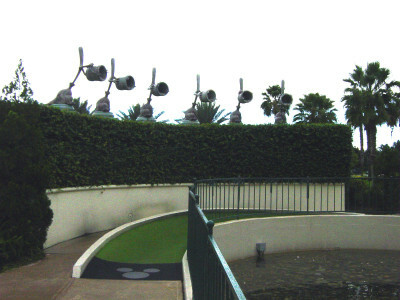 The first hole plays off of the "treble" in the description, as the ball must go through a horn, then up and around a giant treble clef. Photo by Mark Goldhaber. 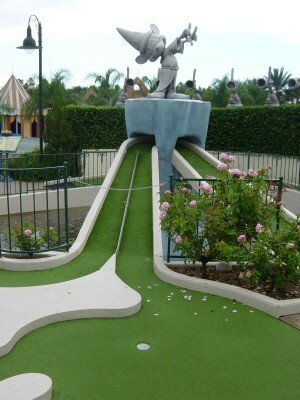 On the second hole, you must putt the ball around or through musical notes. Photo by Mark Goldhaber. 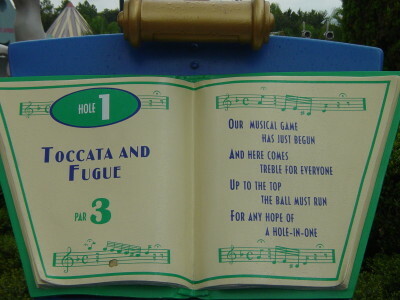 The final Toccata and Fugue hole is a standard up-and-around hole, with the added feature of chimes for the ball to bounce on and play a tune while on the way down. Photo by Mark Goldhaber. 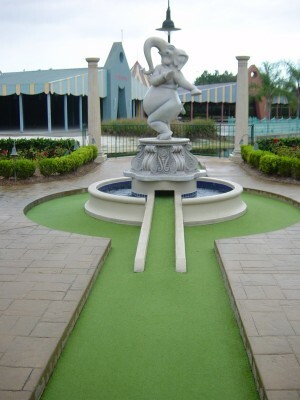 The Nutcracker Suite section of the course begins themed to the Dance of the Reed Flutes segment of Fantasia, as you must putt the ball into the open bloom floating on the "water" on the left. Photo by Mark Goldhaber. Interestingly, the signs for "The Nutcracker Suite" section of the course show music from the Marche section of the piece, which is not used in the film. Photo by Mark Goldhaber. 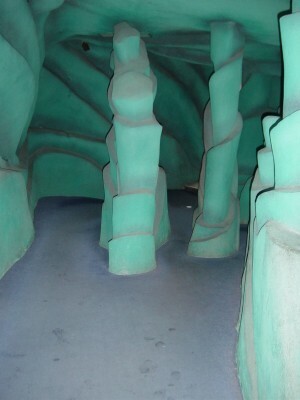 Themed to the Chinese Dance section of the film, there are multiple locations for the ball to hop into a hole down to the lower section of this hole. 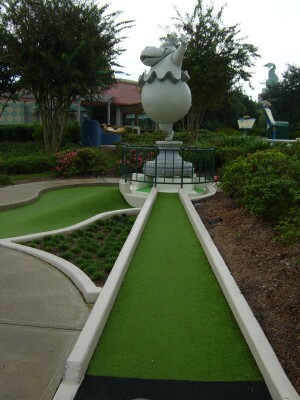 The opening at the base of "Hop Low" (the little mushroom in the middle that does "hop" up and down), however, is the only one that leads straight to the cup. Photo by Mark Goldhaber. 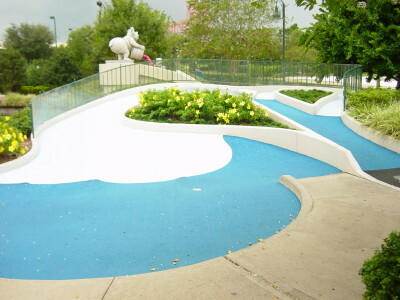 There are multiple paths through the "ice" at the upper section of this hole, themed to the Waltz of the Flowers portion of the Suite's appearance in Fantasia, though the path that takes is closest to the cup is the leftmost one. Photo by Mark Goldhaber. 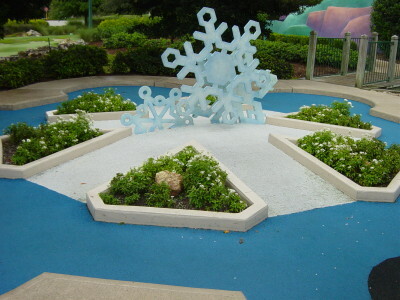 The final hole in "The Nutcracker Suite" section of the course is also themed to the Waltz of the Flowers segment, and turns a standard mini-golf windmill into a rotating snowflake. Photo by Mark Goldhaber. And what mythological creatures it holds! 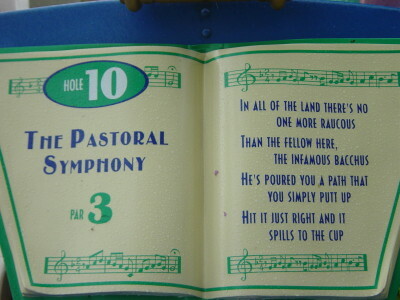 "The Pastoral Symphony" section of the course kicks off with a hole that runs through the interior of Mount Olympus. Photo by Mark Goldhaber. 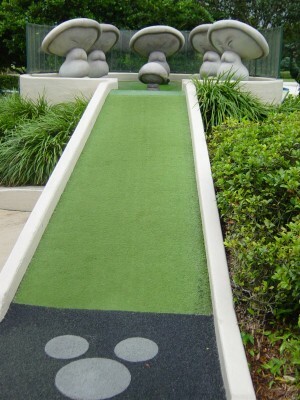 The placement of the pillars makes it difficult to get the ball through in one putt. Photo by Mark Goldhaber. While this is a relatively simple hole with a straight shot to the cup, there is a ring of raised ground around the hole to divert your shot. Photo by Mark Goldhaber. 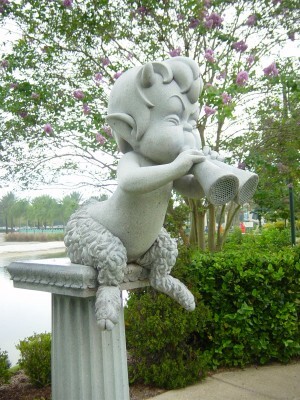 A faun sculpture behind the hole plays his pipes when the ball goes in. Photo by Mark Goldhaber. The Pastoral Symphony signs contain music from the opening sequence for this segment, which features fauns and unicorns cavorting in the countryside. Photo by Mark Goldhaber. This hole features one path up (from the right in photo) and two paths down (center and left). The path to the hole is the one in the center. Mount Olympus (from Hole 8) is framed nicely in the background. Photo by Mark Goldhaber. 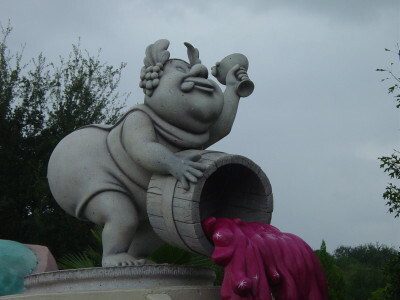 Bacchus presides over Hole 10, pouring out the "wine." Photo by Mark Goldhaber. 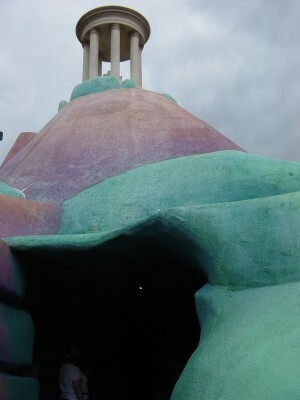 This "wiggle" hole features the ostriches from the opening portion of Dance of the Hours at each curve in the green. Photo by Mark Goldhaber. This is a "target" hole, where putting the ball through Ben Ali Gator's mouth puts the ball straight through to the hole. Otherwise you'll have to putt around the obstruction in the middle. Photo by Mark Goldhaber. 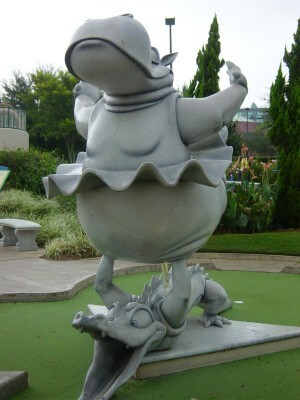 Ben Ali Gator lifts Hyacinth Hippo in the middle of the hole. Photo by Mark Goldhaber. The Dance of the Hours signs feature music from the "chase scene" at the end of the piece. Photo by Mark Goldhaber. 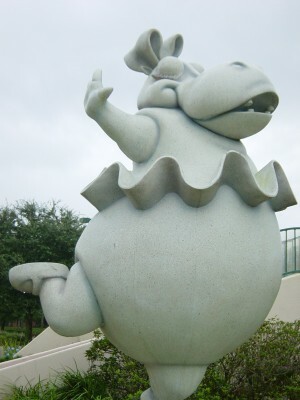 A "pirouetting" Hyacinth Hippo has two curved paths underneath her, which determine which path the ball takes to the hole. 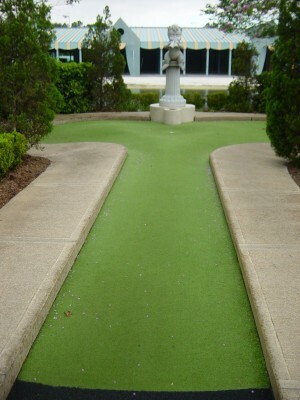 Try to putt the ball so that it goes into a path that curves to the left for the best score. Photo by Mark Goldhaber. 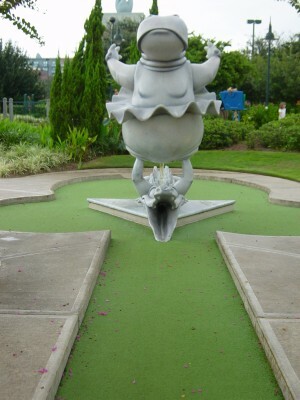 Hyacinth Hippo makes a solo appearance on this hole. Photo by Mark Goldhaber. Another "target" hole, this one forces you to choose between trying to get it up the path below the elephant or to plan to go around the obstruction. Photo by Mark Goldhaber. 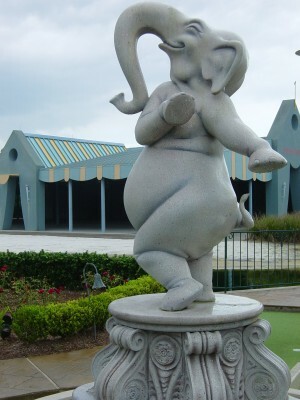 An elephant joyfully dances at hole number 14. Photo by Mark Goldhaber. 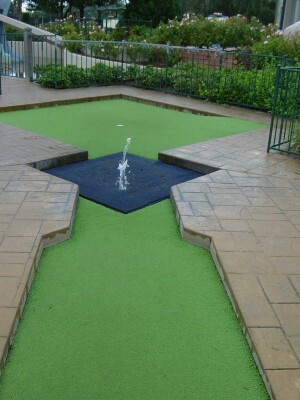 This hole is fairly simple; just putt through hopping fountains. Photo by Mark Goldhaber. 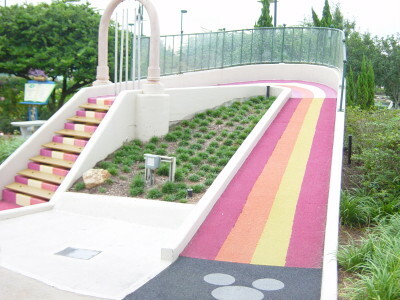 While this is a simple "curve right" hole, the trick is that sensors across the path detect when people are walking past, and the brooms "toss" water in sequence from their buckets over the heads of the people. Photo by Mark Goldhaber. 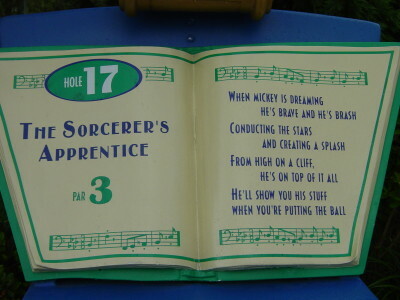 The "music stands" for The Sorcerer's Apprentice holes feature notes spelling out the recognizable theme that is played as the brooms do their stuff. Photo by Mark Goldhaber. This "up and down" hole features a split at the top that decides whether your ball comes down near the hole or with a long path ahead of you. Photo by Mark Goldhaber. 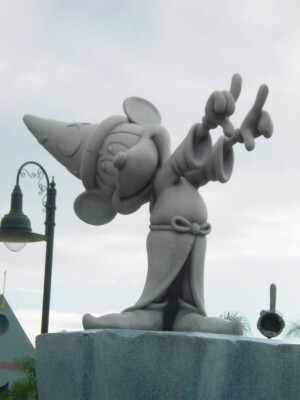 Mickey conducts the powers of the cosmos from atop his cliff. Photo by Mark Goldhaber. The brooms in the background were too slow to catch the golfers with their water. 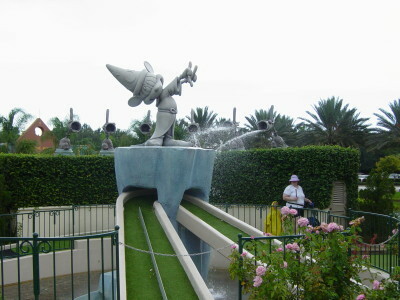 Mickey, in the foreground, will make water splash up from the pond when the ball goes underneath him. Photo by Mark Goldhaber. We hope you'll return here again and again! As the ball goes into the final hole, water sprays up from the cup. Photo by Mark Goldhaber. 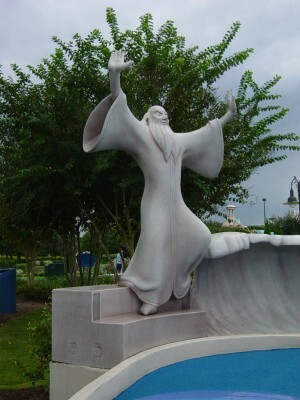 Yen Sid the sorcerer presides over the 18th hole. Photo by Mark Goldhaber. 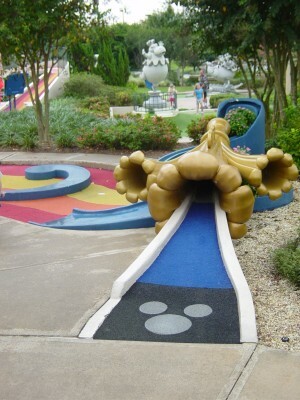 As with most mini-golf courses, the 18th hole will "eat" your ball, sending it to a holding bin, so that your club is all that you have to return. 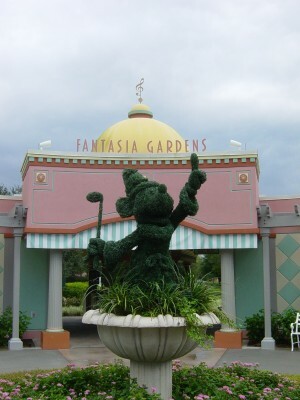 Adjacent to the Fantasia Gardens course is another course called Fantasia Fairways. This course is actually a regular golf course, shrunk down to putting size. Both 18-hole courses are controlled by the same desk. 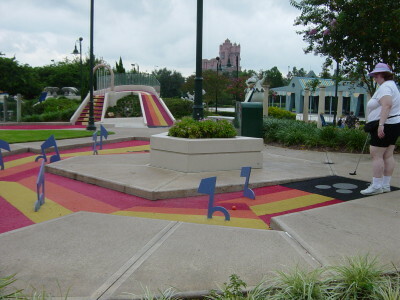 They are located across Epcot Resorts Boulevard from the Walt Disney World Dolphin Hotel, between the hotel and Buena Vista Drive. It's an easy walk from the Dolphin, but be careful crossing the street. For more information, call 407-560-8760.